On Saturday, April 21, 2012, knights in shining armour will invade the wild west. EarlyAct FirstKnight, an educational organization that encourages school children to become noble, service-oriented people, will be holding its third annual convention in conjunction with the Boerne Wild West Day at Enchanted Springs Ranch. 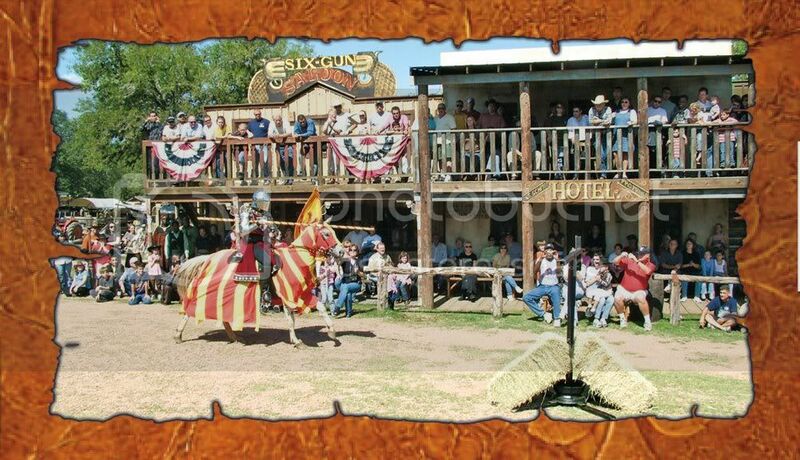 As part of the convention, knights/jousters Dr. Randall Parr, Cass Garcia, Amber Parr and Steve Hemphill will perform a “Tournament of Champions” in the main street of the Old West Town that is regularly used as a movie set for westerns. In addition to being jousters, Dr. Randall Parr and Cass Garcia are actual modern day Knights Templar. Amber Parr is Randall's wife and serves as an example that chivalry – and the ability to joust – are not limited to the male gender. Steve Hemphill is one of the highest ranked competitive jousters in the US and is the producer of "Lysts on the Lake", the largest competitive jousting tournament in the world. Dr. Randall Parr and the Knights of the Guild created EarlyAct FirstKnight (EAFK) to teach children in grades K – 8 the virtues of compassion, confidence, discipline, friendliness, honesty, perseverance, respect, responsibility, service and tolerance. EAFK uses actual jousters/knights to entertain, educate and reward the children who participate in their program. Bourne Wild West Day is organized by the Rotary Club of Boerne and provides a day for families to enjoy enriching entertainment and history, full of stagecoach rides, gunfights and numerous exhibitions of valor, skill and bravery displayed by professional performers. There will also be live music and a Texas Hold'em poker tournament.